Hello, Here is my rescue GSD, Sam. She is 4 years old and we brought her home from the ASPCA just under a month ago. For a dog who has had little to no time invested in her, she is extremely happy to please, quick to learn & the sweetest creature I've ever met. She was very timid and anxious at first but she is already blossoming & we're seeing her personality come out as well as her confidence grow. She is the dog of my dreams & a total beauty. Hello to you Adrian. What a wonderful story you have just told us above. 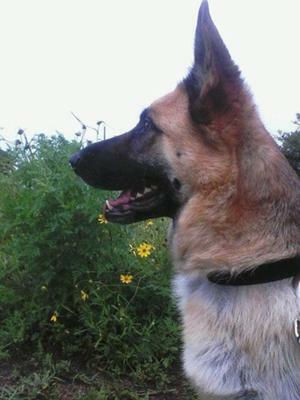 Thanks so much for taking the time to come here and share your own German Shepherd Dog rescue story and picture of your beautiful German Shepherd Dog Sam with us all here. And what a great picture of her too that you have sent to us here. Beautiful story. And good for you giving this wonderful German Shepherd a new and stable home. I wish more people would do this as well.